The Terriers resume play today with a first round game against St. Lawrence in the Ledyard Bank Tournament in Hanover, N.H. INCH has a tournament preview and BU game notes have been posted. While there is no mention of it in the media, one unofficial report indicates that Kevin Schaeffer will return to the lineup today. Brandon Yip is now due to return for next week’s Providence/Merrimack games. Host Dartmouth meets North Dakota in the other semi, which has been a bit overshadowed by controversy over UND’s nickname, the Sioux. Chris Drury has been on a tear this week, following a 2 goal, 2 assist game against the Caps with his 20th goal of the season last night against Carolina. Drury is tied for the Sabres team lead with ex-Gopher Thomas Vanek...Mike Eruzione’s son, Paul, is playing varsity hockey for Berkshire School in Sheffield, where he also is a baseball standout...2008 Terrier recruit Corey Trivino was named to the Ontario U17 team. He is one of only three squad members from junior A rather than the OHL. Another of the junior A players chosen, St. Mike's defenseman Brandon Burlon, has caught the eye of BU recruiters for 2008. Camrose Kodiaks forward Mike Connolly, one of BU’s top targets for 2008 was named to the AJHL all-star game. Connolly did not visit BU in December, as posted earlier, but is expected to make an official visit in January. Another player named to the AJHL all-star game, goalie Kieran Millan, is a prospect BU is looking at for its 2008 recruit class. International Scouting Services ranks 2007 recruit U18 forward Colin Wilson #3 for the 2008 NHL draft. For the 2007s draft, ISS currently ranks U18 defenseman and co-captain Kevin Shattenkirk #23. You might recall a few other names on this list—BU targets that made other choices. When former BU All-American and 14 year NHL veteran Shawn McEachern visits Agganis Arena early next month, he'll be working behind the visitors' bench, having been named an assistant coach to Northeastern head coach Greg Cronin. The Globe looks in on Shawn and his new career. Red Line Report likes what it sees in BU's four-man 2007 recruit class, which might add another skater along with a walk-on goalie. 2. Boston University— This class is all about quality over quantity, and it's the best class in the east. Looks like they simply sent all their scouts to watch the U.S. NTDP as they nabbed two potential NHL first-round picks in gritty and talented centre Colin Wilson and superb puck-moving defenseman Kevin Shattenkirk. Their third top recruit is another skilled rearguard in Colby Cohen, who was also in Ann Arbor until moving on to the USHL a month ago. ISS has Wilson listed among its top 5 2008 NHL draft choices. He has a late birthday and misses the 2007 draft. NTDP U18 Ron Rolston commented on Shattenkirk in a recent CSTV.com chat: Kevin Shattenkirk is an extremely talented player, and he's our captain with the 89 birth year here at the National Team Development Program, which speaks volumes of his character. He has the potential to be an elite player at the college level, and he already an elite player with his age group right now, but he certainly has to continue to develop. He has to continue to mature, continue to get stronger and work on the weaknesses in his game, but he's a terrific offensive defenseman with a lot of skill that can be a difference-maker in hockey games. Several future Terriers, including Shattenkirk, Cohen and Corey Trivino, have been mentored in the East Coast Selects program by Travis Howe, Gordie's grandson. ECS is a top spring/summer tournament program that allows young players to compete against elite level teams. ISS recently profiled Howe. 2008 recruit Corey Trivinio is second in scoring on his Stouffville team with 13-22-35 in 34 games. 2008 recruiting target Mike Connolly has been on a tear since his visit to BU early in December. With 10 points in his past 7 games, he's now tied for leading scorer on Camrose Kodiaks, which is Canada's top-ranked junior A team. For the third time in their hockey careers, Rick DiPietro and Freddy Meyer are teammates. The two played together for the NTDP U18s in 98-99 and then were Terrier freshmen in 99-00, both earning Hockey East All Rookie honors. Now, with Meyer's trade today from Philly to the Islanders, the two are teammates again. After starring for the AHL Philadelphia Phantoms two-plus seasons, Freddy earned a regular spot in the Flyers' blueline rotation last year and quickly became a fan favorite. With Philly's woeful start this season, the Flyers have been restructuring their team and acquired Alexei Zhitnik for Meyer. Not counting alumni events, the last time DiPietro and Meyer skated for the same side in a meaningful game was the Terriers' 4 OT loss in the 2000 NCAA regional final to St. Lawrence. The Islanders now boast four ex-Terriers on their squad. Longtime Isle Shawn Bates was joined this year by his former BU teammate Tom Poti, whose career has been resurgent on the Island. The big question, will DiPietro and Bates let Freddy join in on their post-victory jump-bump ritual? This afternoon, the Globe reports one arrest in the Dec. 3 assault on four BU athletes which left Kevin Schaeffer with serious injuries including broken facial bones...Tuesday's Daily Free Press report extensively quotes Coach Parker and several eyewitnesses to the assault...INCH's weekly HE report addresses the incident, too, and also reveals that the proposed outdoor game at Fenway is still under consideration. CSTV promo video. Nicely done. Top Canadian prospect visiting BU this weekend. Camrose Kodiaks center Mike Connelly, a top 2008 recruit prospect (see Nov. 9 blog post) who is expected to choose between BU and Wisconsin, is visiting Boston this weekend and will be at Agganis Arena for Saturday's game. Connolly has 14-15-29 in 27 games for the Kodiaks, the top-ranked Canadian Junior A team. John Laliberte's ECHL success in Trenton has earned him a professional tryout with the Worcester Sharks where he rejoins Dan Spang. John Laliberte, who leads the ECHL Trenton Titans in goals with ten and is among the top rookie scorers in the league. His success is reported in today's Trenton Times....Jakubs Redlihs, a Blue Jacket draft choice, has been promoted from the ECHL Dayton Gems to the AHL Syracuse Crunch. Redlihs played four games for the Crunch last Spring. Defensman Colby Cohen had another game-wining goal for Lincoln (USHL) in the Stars' 4-3 win last Saturday. Through ten games, Cohen has 6 goals and 6 assists…Colin Wilson had the game-tying goal and an assist in the USNTDP U18s 2-2 comeback tie against Robert Morris University. Wilson is second in scoring on the U18s with 8-15-23. Fellow future Terrier Kevin Shattenkirk is the top-scoring defenseman at 5-10-15. The team’s starting line and defense pair all are headed to Hockey East. Besides the Terrier duo, winger James Van Riemsdyk is a UNH recruit, winger Jimmy Hayes is a BC (’08) recruit and Shattenkirk’s partner Joey Lavin is headed to Providence. The U18s are in Maine for the weekend, facing off against Colby tonight and taking on Terry Meagher’s Bowdoin Polar Bears on Sunday. Meagher, a standout on three BU ECAC championship teams in the ‘70s, is in his 24th season at Bowdoin…2008 recruit Corey Trivino, who won’t be 17 until January, is the second leading scorer for Stouffville in the OPJHL. Trivino has recorded 10 goals and 20 assists in 26 games. Longtime Terrier play-by-play announcer Bernie Corbett is co-hosting College Hockey on Campus, a weekly two-hour discussion and interview program. It airs Wednesday nights from 7-9 p.m. (ET) on WZON (1510) in Boston. The program also is accessible on the Internet at www.1510thezone.com/campus/ . Bernie’s co-host is Paul McNamara. Former Terrier star and 2nd team All-American Carl Corazzini is back in the NHL, recalled by the BlackHawks following his hattrick performance last Saturday for Norfolk/AHL. Corazzini, who had played 12 games for the Bruins in 2002-03, scoring two goals, made his BlackHawk debut on Wednesday, and tallied an assist, but Chicago lost, 4-1, to Calgary which received a goal from Tony Amonte... Dan Spang continues to thrive in Worcester, playing for the Sharks' AHL team. He recently participated in an online chat that brought some questions from Terrier fans…Shawn Bates, who tallied a pretty goal for the Islanders in their 4-2 win over Carolina this past week, and Rick DiPietro have begun a post-game ritual following wins. They're the last two Islanders to skate off the ice and leap into the air for some celebratory shoulder-to-shoulder (mild) impact. Coach Ted Nolan doesn't seem to mind...Reaching back a few years, John Bethel played three seasons at BU including the 77-78 national championship run before reaching the NHL with Winnipeg. Participatory hockey is still part of his life, except it’s roller hockey and he’s playing in the Nassau Street Hockey League in the Bahamas. BU-PC is tonight's game and game notes are up along with a link for gametracker and Webcasts (audio and video). According to the Free Press, Coach Parker has tweaked the lines again. Lawrence has yet to find the back of the net this season, Mac has gone a while without scoring and Boomer is just back. Terriers' scoring slump could be relieved if this trio finds some chemistry. Once again Steve Smolinsky is not in the lineup. A few years ago, BU outbid Michigan State, Colorado College and a few Hockey East rivals for Smolinsky's commitment, following a standout performance in the Midget Nationals. He brought a reputation for outstanding speed and solid offensive skills. Why hasn't he earned more starts in his year-plus in the program? What's holding him back? Has he been willing to pay the price in the defensive end? The Terriers will seek to build upon strong outtings, albeit ties, in the past two games, as they go on the road tonight to play Vermont at Burlington's Gutterson Fieldhouse. BU's last trip to UVM, in February, resulted in a pair of low-scoring ties. A pre-game article on the BU athletics site includes links to the radio Webcast and gametracker. The game will be broadcast on CN8 in New England and also is available as a free Webcast on the CN8 Live site. The Free Press also previews tonight games. Senior winger Kenny Roche's hattrick against New Hampshire earned him Hockey East co-player of the week honors. BU travels to the Whitt tonight to play the University of New Hampshire which is coming off a sweep of Northeastern. The Wildcats are led by sophomore center Trevor Smith, an emerging star who is tied for the Hockey East scoring lead. The link to BU gamenotes, the CSTV gametracker and the Internet broadcast of the game is here. UNH game notes are at this link. The game will be broadcast on NHPTV and there is a free Webcast of tonight’s game on the New Hampshire Public TV Web site. An access link will appear on the homepage a few minutes before gametime. Dave Hendrickson’s weekly Hockey East column on USCHO has been posted. He predicts a UNH win tonight, but see the Terriers bouncing back on Tuesday against Vermont. Comments from Jack Parker are featured in a CSTV column on expectations for traditional college hockey powers. Leader of the red-hot Sabres interviewed by ESPN. NHL Central Scouting has released its preliminary ratings of 2007 draft eligible players to watch. Those selected get either an A or B rating. Defensemen Kevin Shattenkirk (NTDP U18s) and Colby Cohen (Lincoln Stars) both received A ratings, while forward Nick Bonino (Avon Old Farms) had a B rating. Colin Wilson has a late birthdate and is not eligible for the 2007 draft. Among some of the prospects BU is pursuing, Salisbury forward Paul Carey received an A rating and Nobles winger Andrew Glass received a B rating. Cohen has been thriving since leaving the NTDP U18s and joining the USHL Lincoln Stars. He has scored 4 goals in his first four games, including a hattrick (plus an assist) this past weekend in a 7-5 win. Shattenkirk and Wilson are in Sweden this week as the U18s participate in the 4 Nations Tournament. Through 16 games Wilson is 2nd in team scoring and Shattenkirk is 4th. The team, now 12-4, recently swept a pair of games in upstate New York, beating Clarkson and SUNYPlattsburgh. Today's Daily Free Press reports Boomer Ewing will return to the lineup for tomorrow night’s game against UNH. He’ll skate on the first line with Peter MacArthur and Matt Gilroy. Brandon Yip’s return from a serious shoulder separation is targeted for the Dartmouth holiday tournament. The Free Press also took a look this week at freshman Luke Popko, whom server observer felt was the best Terrier on the ice in the 2-2 OT tie against Maine last Saturday. Last year, Connolly captained the Calgary AAA Buffalos to the AMHL title and into the Telus Cup tournament (Canada’s national midget championship) where he was named Most Valuable Player. BU freshman Eric Gryba was named top defenseman in the 2005 Telus Cup. Last month, the Alberta Hockey Now site profiled Connolly, who also has been mentioned in Paul Shaheen's Research on Ice newsletter. During the past two weeks, two of Connolly's Camrose teammates, Chris Barton and Karl Stollery, have committed to Merrimack, and another teammate, Joe Colborne, is being pursued by several Ivies. Perhaps those cold Canadian winds blowing off the prairie will continue to reach the East coast. BU-Lowell Game Notes are now available along with links to the audio Webcast, the CSTV All-Access video Webcast and the CSTV gametracker. The Daily Free Press preview article indicates a change in tonight's lineup. Matt Gilroy, pressed into service at forward following injuries to Bryan Ewing and Brandon Yip, moves up to the White Line with Chris Higgins and Jason Lawrence, while Ryan Weston is reunited with Brian McGuirk and John McCarthy on the Orange Line. The first and fourth lines remain intact as do the defensive pairings. Gilroy brings good offensive skills to the second line, similar to Yips. And, like Yip, he can move over to the point on powerplays with Popko centering the second powerplay unit, as he did last weekend. when the Warriors were on the attack. He and Strait even spent some time on the powerplay. McGoff came to BU with a strong reputation. Circumstances have worked against him his first two year. Now presented with an opportunity, we'll see how he responds. USHR reports that Colby Cohen was claimed yesterday by the Lincoln Stars and will be in uniform for the Stars' game against Tri-City tonight...Also on the recruiting front, a 2008 defenseman BU had been recruiting, 6-3 Tommy Cross of Westminster, has committed to BC. Providence and several Ivies also were in the mix for the Simsbury, Connecticut, native who recently was named to join the NTDP U18 for their upcoming tournament in Sweden. He replaces Cohen on the roster. BU 2007 recruit defenseman Colby Cohen reportedly has left the NTDP U18 program and is seeking to relocate to a USHL team. The story has been reported for several days on USHR, a subscription site. It appears Cohen, who was among the U18s’ top scorers earlier this year and had a strong Select 17 tournament during the summer, was not happy about his icetime. The USHR reports say BU wanted him to stay with the NTDP and had persuaded him not to leave the program last Spring. The report also indicates friction between Cohen and some of his teammates. In a hockeyfuture.com article we’d previously referenced, U18 coach Ron Rolston praised Cohen’s ability, but questioned his decision-making. Another defenseman on the squad, Dave Kolamaitis, who had been a UNH recruit, left the team during the summer for the OHL. Two seasons ago, two players (Mike Stuart and Chris Cahill) left the Rolston-coached U18 team in midseason. USHR also reports that Cohen still plans to play at BU next season. We’ll report further on this matter as more facts become available. A thread on the USCHO messageboard asks about each school’s top walk-on players. Several Terriers come to mind, beginning with current goalie John Curry and the versatile Matt Gilroy. Matt Radoslovich was a rare unrecruited walk-on who made the team and was an important contributor. Others include Ken Rausch, a member of the 1995 NCAA title team, Mike Grier, also on the 94-95 squad and an All-American, and Doug Friedman, who captained the Terriers in 93-94 and later had a cup of coffee in the NHL. Keith Emery was a walk-on defenseman who had a few solid season on the BU blueline. Are we missing any who were major contributors. Who were your own favorites and why? New England Hockey Journal named BU Captain Sean Sullivan its HE Player of the Week for his efforts against Northeastern and RPI....INCH, Hockey East Online and The Boston Globe have issued previews of this weekend’s games...This article is a week or so old but an interesting take on Jakubs Redlihs who is holding down a blueline spot for the Dayton Bombers, who recently acquired Justin Maiser...We’ve reported on most of the graduates from last season’s team. Dan Spang is in Worcester, Brad Zancanaro is playing for Albany, John Lalberte is in Trenton (with Mike Pandolfo and Greg Johnson). Vandy is playing in Omaha. Now we’ve located Jakubs Redlihs who is holding down a blueline spot for the Dayton Bombers, who recently acquired Justin Maiser. We've just learned that the CSTV-All Access service will be available for BU home games, begininning with tonight's game. This is a pay-per-view Webcast using the video feed from the Agganis Arena scoreboard and the audio from the game broadcast by Bernie Corbett and Tom Ryan. Last year, it was possible to view the games live or later as an archive. Cost last year was $5 per game. Details for signing up are expected to appear on the BU athletics Web site this afternoon. BU’s first two-game weekend features tonight's home opener against Northeastern and tomorrow's visit to Merrimack’s Volpe Arena. Will John Curry be between the pipes both nights or will Karson Gillespie or Brett Bennett get a start? ….USCHO Correspondent Dave Hendrickson’s information-laden This Week In Hockey East column has returned. Dave predicts a pair of Terrier wins this weekend. Will he be a prophet or the kiss-of-death?.... The BU athletics Web site game notes are not yet posted, but should be available later today.…The NTDP U-18s won another game against NCAA competition, edging Michigan State 5-4, Thursday night. Colin Wilson and Colby Cohen recorded assists. The U18s recently took both Michigan and BC to overtime before losing. Ready for another hockey movie? David Kelley, Mike Illitch, the Baldwins (Howard and Karen, not Alec and Billy) and the Howe family think so. They’ll collaborate on a film about the WHA’s second season, 1973-74, when 44 year old Gordie came out of retirement to join sons Mark and Marty on the Houston Aeros. David Kelley, of course, is the son of former BU coach Jack Kelley, and the award-winning writer director whose credits include Ally McBeal, The Practice and Mystery Alaska. Howard Baldwin was the original owner of the New England Whalers when Jack was coach and general manager, and later owner of the Pittsburgh Penguins with the elder Kelley serving as team president. So, who will play the role of NHL Hall of Famer Howe? Bobby Hanson, who portrayed David Silk in Miracle? Too young. BU All-American Mike Hyndman, who played Cornell’s Francois LaFleur in Love Story and punched out Ryan O’Neal? Too old. How about MacGyver—Richard Dean Anderson? He’s about the right age and still plays in charity hockey games. One more BU connection here is Travis Howe, Gordie’s grandson, who heads the East Coast Selects program and has coached future Terriers Kevin Shattenkirk, Colby Cohen and Corey Trivino. INCH has posted its weekly Hockey East notebook….New England Hockey Journal looks at two goalies from opposite ends of Comm. Ave—BU’s John Curry and BC’s Cory Schneider....Hockeysfuture.com has posted an article about members of the NTDP U18 team who are eligible for the 2007 NHL draft. Player descriptions are from their coach, Ron Rolston. While Colin Wilson has a late birthday and isn’t eligible next Spring, Rolston also offers some thoughts on Colin and also BC recruit Jimmy Hayes, who also has a late birthday....If you plan to follow Friday’s home opener against Northeastern on the radio or via the Webcast, CSTV’s gametracker will be available. There is a link on the CSTV College Hockey homepage and, later this week, a link will appear on the BU Athletics homepage....In an Oct. 17 post, The Western College Hockey blog offered an interesting look at the Alaska rivalry between UA-Anchorage and UA-Fairbanks. Coach Parker noted in his podcast interview that a trip to Alaska was on next season’s schedule and Scarlet informs us that the trip is for games with each of the UA teams, rather than a season-opening tournament....Jay Pandolfo scored his first goal of the season last night, putting him just half a dozen behind NHL goalscoring leader Chris Drury. Devil’s announcer Mike Emrick pointed out that in the history of the Stanley Cup playoffs, Jay has the lowest ratio of penalty minutes to playoff games played. (There are stats for everything.) That’s quite impressive considering Jay and his partner John Madden are usually matched against their opponents best offensive players. So much for the McConnell-Maiser reunion in Trenton. Brian was released yesterday and Justin was traded to the Dayton Gems. Johnson and Laliberte will have to muck on without them. Saturday night’s season-opening 4-4 tie with Renssalaer is examined by The Daily Free Press with a focus on the bushel of “dumb and undisciplined” penalties taken by the Terriers. BU is adopting a new approach to killing penalties this season and the RPI game provided ample opportunities to try it out. The Terriers were shorthanded 13 times, and killed 11 Engineer powerplays, including the entire first eight minutes of the second period....Prior to the RPI game, The Saratogian profiled junior forward Peter MacArthur, a native of upstate New York where he played for Northwood Prep. Jack Parker and Terrier radio announcer Bernie Corbett have teamed up for a 30-minute video preview of the new season. The interview, featuring highlights of last season and some pre-season practice video, can be seen as a podcast which is easily downloaded from the the BU athletics Web site. Click on the “subscribe link” and, if necessary, download the free itunes software. Discussing the freshman class, Coach Parker compares the skill and flash of goalie Brett Bennett to that of Sean Fields and likens defenseman Brian Strait to Dan Spang, an All-American last season. In addition to looking at the roles to be played by returning players and newcomers, Coach Parker discusses some of the out-of-conference games on the 2006-2007 schedule which includes trips to Michigan and Alaska (perhaps to open the season at the Nye Frontier Classic?--TBD) and the renewal of the BU-Cornell rivalry, beginning with a neutral ice matchup at Madison Square Garden the Saturday after Thanksgiving. The interview also reveals that, during the current season’s December 2 game against Boston College at Agganis Arena, BU will honor the 1976-1977 squad, captained by Mike Eruzione and Rick Meagher, whose seniors won four consecutive ECAC tournament championships. Justin Maiser and Brian McConnell were teammates for two seasons in the National Team Development Program and another two at BU. Brian stayed in school while Justin moved on to the WHL. Now, they’re back together as linemates on the ECHL Trenton Titans and the old chemistry remains strong. Maiser scored the game-winner in the Titans’ first exhibition game with a assist going to McConnell. Gregg Johnson and 2006 grad John Laliberte, who scored in each of the two exhibitions this past weekend, also are on the Titan’s roster. All four were Terrier teammates in 2002-03. The M. Pandolfo listed on the gamesheet is ex-Lowell forward Mark Pandolfo. Games notes and Webcast link. With high expectations, the Terriers head West on the Mass Pike today to meet the Rensselaer Engineers, BU’s frequent season-opening opponent. The Daily Free Press provides a game preview that reveals some line shuffling. Coach Parker has reunited last year’s freshman line, and moved Eric Thomassian to the third line with Brian McGuirk and John McCarthy. Ryan Weston, who earned Parker’s praise for his effort in the exhibition game, moves to the offwing on the 4th line with rightwing Steve Smolinsky adding some speed to the checking unit. They’ll be centered by freshman Luke Popko, whom Parker has dubbed “our new Zanc.” The first unit remains intact. We’ll update this post when BU’s game notes are available. Some of the message board discussion of Terrier fans’ choice of seats at RPI’s Houston Field House—either behind the goal at one end or beyond the goal line alongside the other end—recalls a memorable trip to Troy, for both fans and players, in 1971. Just before the student bus left the parking lot after the game, the hoarse crew of fans was startled by Coach Kelley climbing aboard the bus. They were further shocked when “The Mentor” informed them they had made the difference in the game were in large part responsible for the win. His words of thanks –and a stop for “refreshments”— made for a remarkably quick and happy return to Boston. During last weekend’s exhibition game at Agganis Arena, the Friends of BU Hockey Lounge was dedicated. Jack Parker marked the occasion by presenting Friends’ sweaters to original members Hank Freniere and Bill Leary. The 80th birthday of Jodi Sidd, widow of another Friends founder, Al Sidd, also was celebrated. Former coach Jack Kelley organized the Friends of BU Hockey in the early 1960s to build alumni and fan support for the hockey program. The organization was instrumental in the fundraising for Walter Brown Arena and remains at the forefront of the BU hockey community. The current president of The Friends is Paul Giandomenico, a member of both the 1971 and 1972 NCAA championship teams. Future plans for the lounge include adding several plaques detailing the mission and early history of the Friends, as well a photo wall that will make the room a veritable Who’s Who of the BU Hockey program. The dedication ceremony was well attended and among the former players on hand was a contingent of Canadian alums, including Fred “The Bear” Bassi, Mark Fennie, and Darrell Abbott. Coach Kelley was unable to attend the event, but plans to visit HAA for several games this season. A pre-game meal is regularly served in the lounge for members of The Friends and beverages are available for them between the periods and after the game. Click here for information on Friends of BU Hockey activities and membership details. Today, USA hockey's Web site takes a look at NTDP U17 Coach John Hynes, a one-time Terrier walk-on and now one of the bright young stars of coaching. The article discusses the impact on Hynes' career of his years as a player and volunteer assistant at BU. Hynes guided the development of current freshmen Brett Bennett, Luke Popko and Brian Strait for the past two seasons and led the U18s to the IIHF World Under-18 Championship last Spring. INCH has introduced a Monday feature, First Shift, which provides a quick recap of the previous weekend’s college hockey activity….An ESPN.com feature ranks the ten “Ultimate Hockey Experiences in North America.” The Beanpot was rated third. First? The Quebec International Pee-Wee Tournament....Coach Parker’s comments about Saturday’s 3-2 exhibition win over New Brunswick appeared in the Daily Free Press. Look for a new penalty-killing scheme this season. Parker acknowledged the team needs to work on the power play…Two more Hockey East season previews have appeared, one from the Boston Globe and the other from Dave Hendrickson and Scott Weighart of USCHO. We’ve added a new entry to the sidebar list of recruiting links. This Web page tracks scoring totals for the NTDP U18 team. Through nine games, Colin Wilson is tied for the team scoring lead, while both Kevin Shattenkirk and Colby Cohen are among the top five. In the U18s 3-2 OT loss to Michigan this past Sunday, Wilson, who scored his sixth goal of the season, centered the first line between future Hockey East opponents Jimmy Hayes (BC) and James Van Riemsdyk (UNH). Eighteen regular season games will be televised this season. Eight of the games will be on Comcast’s CN8, which has replaced NESN as the carrier for BU’s own schedule of games. Those who don’t get CN8 can watch those games as Webcasts on the CN8 Live Web site. BU also will appear on NESN three times on the Hockey East regular season schedule and for Beanpot broadcasts. Two games will air on CSTV and single games will be on NHPTV (also a a Webcast), Cox Cable and WBAI. For a full schedule, go to College Hockey on TV (link also found on this blog's sidebar), then choose BU in the team filter box and click on “Show all upcoming games.” A complete league television schedule is available on the HockeyEastonline.com site. "The USHL held its Futures Draft two days ago. The first overall pick? Ohio selected 2008 Boston College recruit Jimmy Hayes, a star forward with the US NTDP in Ann Arbor. 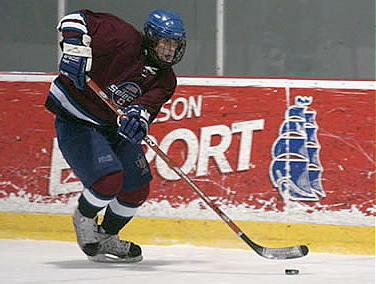 Second was Cushing Academy defenseman and 2008 Boston University recruit David Warsofsky. "We found it interesting that Omaha selected both Warsofsky (in round one) and Cushing's Matt White (Five Good Minutes, ROI July 11, 2006) in round three. Interesting in that White is being watched closely by coach Jack Parker and the Terriers. Could Warsofsky and White both follow in each other's footsteps--from Cushing to Omaha to Commonwealth Avenue?" THFB reported on Sept.13 that White and Warsofsky's Cushing and GBL Jr. Bruins(AAA Midget) teammate, Ryan Bourque, had recently visited BU. Results of the USHL futures draft. Nobles forward Andrew Glass who is being recruited by BU, BC and Harvard, was taken in the 10th round. defkit's take on Midnight Mania on the players and the on-ice doings. I reached WBA with the countdown at 30 seconds (I'd been on the ice in Marlboro at 11:05! )...timing is everything. I have to say that as I walked in off the street and could hear the roar of the crowd, it got my blood pumping in a way that HAA unfortunately will never be able to. But that's okay, we need HAA, and it is a phenomenal arena. But just for a night, it was great to be back in the old barn. You just can't compare the way the fans are right on top of the action. I was impressed with the size of the crowd. I was saying to myself that as the freshmen are skating onto the ice in this environment, they are saying to themselves..."this is why I chose BU, and I'm glad I did." - Glad to hear only a slight hint of booing during Parkers remarks, and also glad to hear the cheering when he was done discussing the swearing. - Bennett definitely is a crowd pleaser, pumping the arms, and diving for the finish line in the fastest goalie competition to try to make up ground on KG. - I know it's just goofing around, but dang, the players on this team sure can dangle the puck around. The sophomore line on the 3-0 drills was sick. - I still can't believe what Lawrence did on the breakaway drills. First he did the Mike Legg scoop up and spin around throwing the puck at the net. Nice, but I've seen many guys do it. However, on his last breakaway, he took it to a whole new level. Once he has the puck scooped up, he lifted his stick so it was straight up in the air and flicked the stick back and forth (picture a lacrosse player flicking his stick, spinning it side to side) about 4 times before he finally lost control of the puck. Obviously, it wouldn't be legal in a game, but it was sick. Of course, that has nothing to do with how he'll be as a player, but it was pretty cool to watch. - I watched Strait quite a bit, and thought he looked very good. Just a solid mix of skating, stickhandling, and passing.- Gryba looked like he can get that big frame moving. In the first of two guest posts on Midnight Mania, Scarlet provides insights on the atmosphere and enthusiasm at the event. She also took this photo of four sophomores (L-R, Higgins, McCarthy, Gilroy and Lawrence) with Rhett. I arrived at Walter Brown Arena 9 pm. My friends and I walked in and immediately went to our old seats. After sitting in them for about 10 minutes, the stroll down memory lane was over as we all realized how uncomfortable the benches were. Yes, the old barn has a lot of charm and some awesome memories, but sadly, not very comfortable seating. My friend Laura was emceeing the festivities so I was able to hang out with her down at ice level, on the bench. It was an interesting perspective. The doors opened prior to 11pm and for about a half hour, there was a solid stream of students entering the building. The band was out in full force. I forgot how the sound bounces off the low ceiling. They were playing prior to everyone getting there and wow, loud. And good. The team was hanging out on the ice, not dressed yet. I would have liked to have gotten the reaction from the freshmen and sophomores, as I'm sure they didn't know what to expect. Thirty seconds after Section 8 filled up, they all did their infamous Song, to Rough em Up. Nice. Not even here a full minute and they're already swearing, and right after a get together up in Case Gym with Dean Elmore and Mike Lynch. But wait! A student leans over to tell me they're saying "Puck em Up", not using the F-word. Sure, that makes it all better. The music alternates between the band and the DJ. The students are all standing, chatting, chanting, just having fun. About 11:30, the games begin. Laura heads out on the ice with some students. She tries to explain the rules of the game about to be played, to no avail, no one can hear. Another thing I do not miss about WBA - the pretty lousy sound system. There was an electric car race, a Let's Make a Deal game (which gave me an opportunity to play Carol Merrill and display the envelope choices), an accurate shot game with these little teeny nets that I think the coaching staff should utilize to improve shot accuracy, and a Name That Tune game. During one of the breaks I chatted with Dan McGoff, pointed to Laura and told him that she was responsible for the very first Midnight Madness at Walter Brown. He was sufficiently impressed and proceeded to tell me he loves in WBA and wishes they still played there. So much for the $95 million palace on the next block. The team was hanging out on the bench and definitely got a kick out of the goings on. They were particularly interested in signs some female fans were holding over in section 2. Ah, young lust. They were also confiscating most of the candy that Rhett was supposed to throw to the fans. "But I love Dots!!!" said Ryan Monaghan. They were using the Zamboni entrance for the player entrance and there were red lights and a smoke machine - neither of which were used at prior Midnight Madnesses at WBA. Then, they lowered the lights and the team came out on the ice through all that-- pretty cool. The place was incredibly loud. The lights stayed off as the team lined up in front of the visitors bench. Jack skated out to say a few words. He touched upon the new swearing policy, amidst a few boos, then turned it over to Jim Prior for introductions. Again, a difference from previous MMs where the players lined up on the goal lines. And what would a Midnight Mania be without at least one incorrect player announcement? The more things change, the more they stay the same. This year it was Luke Popko. Once that was all done, the lights came up, and the skating and passing drills began. I decided to walk around at this point and can't provide the best recap of the rest of the evening. Once the drills were over, the skills challenge began and the team had fun with it. Everyone got pumped for the start of the season, which Jack had to remind everyone was the exhibition on Saturday the 7th. I'm so glad they resurrected this event and held it at WBA. It definitely added to the festive atmosphere and brought back some great memories. But now, a new season begins and all is right in the world. Former BU defenseman Dan Spang, an All American his senior season, was recently sent to the AHL Worcester Sharks after a strong showing in San Jose training camp. So, his minor league career continues (he played briefly in Cleveland last spring) on the same ice, the DCU Center, where his college career ended. Midnight Mania begins at Agganis Arena in just under three hours. It's the second milestone, following Captain's practice, pointing toward the new season. The event, originally for Saturday afternoon, was restored as a late night celebration in response to student request. Now let's see how they respond to the challenge to cut back on crude and replace it with clever, without losing any of the enthusiasm and noise level enhance the HAA home ice advantage. Expectations must be realistic, too. It won't happen overnight. If you can't be there tonight, first we have the video clip BU produced, featuring Sean Sullivan and co-captains John Curry and Ken Roche to promote the event. We'll have a guest report posted on the evening's activities. With the 2006-07 season just around the corner, polls and predictions are in the air. The USCHO/CSTV poll ranks BU fourth behind Wisconsin, BC, and Minnesota. Hockey East held its media day this week and its coaches poll ranks the Terriers 2nd behind the Eagles. As always, Jack Parker is quoted is extensively. INCH’s Hockey East preview picks the guys in Scarlet to finish third behind BC and Maine. The article suggests that BU will overcome the loss of three senior forwards with even better performances from the two returning lines. It also reminds us that BU is very unlikely to repeat its 19-1-2 run beginning in December [Looking back, that was a truly exceptional effort.]. By the same token, BU can not be expected to duplicate the 5-6-2 record in the first 13 games. BU’s schedule puts it in a position for a strong start. Whether or not that happens remains to be seen. Finally, congratulations to Coach Brian Durocher, whose second year varsity women's squad came in third in the Hockey East preseason poll just ahead of the Providence Lady Friars, coached by another former BU netminder, Bob Deraney. Durocher has brought two high-quality classes of recruits into the program with a number of important transfers complementing the first-year players. For this season he had added a foundation defenseman in Julie Poulin who transferred from Maine after leading her team in assists and earning All-HE honorable mention. The team's standout goalie Alysse Wilcox played in the same junior program, Honeybaked, as incoming men's goalie Brett Bennett. We'll be keeping an eye on the Lady Terriers from time to time. Some comments on these rankings? It was another good weekend for the future Terrier contingent on the NTDP U-18 team, especially Colin Wilson. On Friday, the 6-0, 190 lb center, son of former NHLer Cary Wilson, tallied an unassisted goal and a shorthander en route to a three-point night in the U18s’ 6-4 win over Mahoning Valley. What happened the next night in the U18s’ first game against a USHL team was a true hockey rarity. Tied with Indiana at 1-1 in the waning seconds of the third period, the U-18s faced a two-man disadvantage and a defensive zone draw. Indiana pulled its goalie, creating a 6-on-3 advantage. But Wilson won the faceoff back to RD Kevin Shattenkirk, who fired the puck the length of the ice into the empty net, just beating the buzzer. The assist gave Wilson a team-leading 10 points in 6 games, while Shattenkirk’s second goal of the season also was his second game-winning goal. Details. Dan Spang remains in Sharks camp (along with Mike Grier) and played in San Jose’s 4-3 win last Thursday. He was mentioned in the recap article. David VanderGulik was reassigned by the Flames to the Omaha Knights (AHL) over the weekend. One of our readers spotted a Calgary Herald News story in which Vandy discussed the injury the kept him out half of his senior year. John Laliberte scored his first professional goal in a loss to the Kings, had his photo appear on Yahoo Sports.com and then headed East as he was reassigned to the Albany River Rats (AHL). Brad Zancanaro had previously signed with Albany, through the Carolina Hurricanes organization. For those who follow college hockey recruiting, Paul Shaheen’s e-mail newsletter, Research on Ice, is a must-have resource. Paul, who also pens the recruiting column for INCH, puts together informed and accurate stories about top talent in the junior and prep ranks and also reports recruiting and related news. The newsletter is published several times a week. To receive it, simply e-mail Paul at puckkeg@comcast.net . After a small one-time enrollment fee, there is no other charge for subscribing. One of our readers noticed a Boston Herald report that this past Monday air condition/air quality problems forced the Rolling Stones to move a rehearsal session to the friendlier confines of Agganis Arena. One would guess they used the large club room for the session, which Mick Jagger skipped. But imagine if Coach Quinn or Coach Bavis had been showing a visiting recruiting around Agganis: "Here is our video theater we're we review game tapes. And this is Mike Boyle's state-of-the-art strength and conditioning facility. And (matter-of-factly) the racket you hear from our Club Room is The Rolling Stones. They practice here, too. " Among the fine performances that carried BU to the Hockey East title last season, it’s hard to argue that any was more unexpected than that of Matt Gilroy, a walk-on forward, who transitioned to defense and eventually won a spot on BU’s top pairing with Dan Spang. Gilroy’s poise and ability to rush the puck and step up into plays had Terrier fans wondering “where did this guy come from?” Just as they did the previous year when John Curry emerged as a top goalie. Who will be this season’s surprise? Is this the year Brian McGuirk becomes an important offensive contributor? Does senior Eric Thomassian earn a regular spot and deliver? I’m casting a vote for the speedy Steve Smolinsky. He has the jets and defensive ability. If he can make that freshman-sophomore step-up on the offensive side of the puck, he can help put some scoring into BU’s third line—and justify BU’s winning a bidding war with BC, Michigan State and others for his services. USHR reports strong local competition for two of BU’s recruiting targets for 2008--when five or six forwards will have graduated. ● Andrew Glass is a 6-0 180 left wing, who scored 15-24-39 for Nobles last season. He also plays for the midget Little Bruins in the Jr. Bruins organization. Scouting reports say skating is his best asset and that he has excellent puck skills and creativity. Harvard and BC are the competition for Glass. ●Paul Carey is a 6-1, 185 left wing who scored 16-11-27 for 2006 prep champion Salisbury (coached by ex-Terrier Dan Donato) and previously played at Thayer. He was a 2004 Mass Select 16 teammate of Brian Strait. Providence and Harvard also are interested in Carey. The observer had some extra praise for first year players Strait and Luke Popko. Strait was ranked #2 among all freshman defensemen by INCH, behind the NHL’s top draft choice, Erik Johnson of Minnesota. Speaking of INCH, the Web site ranked BU's overall freshman class #2 in the nation despite the presence of an offensive threat at forward. Let's remember that last season INCH totally ignored Brandon Yip, who became HE's Rookie of the Year. Game three of the NAHL Showcase…more of the same. An 8-0 U18 blitz with all three BU recruits finding the net. Kevin Shattenkirk scored the game-winner while Colby Cohen and Colin Wilson scored 3rd period goals and both also tallied assists. The USA defensemen are being tutored during the tournament by former NHL standout Phil Housely. The U18s' early blowouts support a U.S.Hockey Report opinion piece earlier this week contending that playing 17 games against NAHL teams doesn’t really benefit the players. Shooting fish in a barrel isn’t much of a challenge. USHR editor Chris Warner suggests the U18 players be spread across the teams in the USHL which has become the best feeder league for NCAA teams. He argues that playing a rugged USHL schedule with the challenge of earning playoff spots would be of greater value for even the best U18 players. In the early years of the NTDP program, the U18s did play against USHL teams. Might that scenario be revisited, allowing the U18s to remain together as a team following their U17 season, so that they can be well-prepared for international tournaments, including the World U18s? Taking another look at Devils training camp, the official roster shows three pairs of brothers from the college ranks. Jay Pandolfo is joined by sibling Mike who played at Reading/ECHL and in Germany last season. Brian Gionta’s brother Stephen (BC) is there, too, as are the Parise Brothers, Zach and goalie Jordan, both from UND. More familiar names from the college ranks in Devils camp: Eric Lundberg (PC) Travis Zajac (UND), Rod Pelley (OSU) Alex Brooks (Wisconsin), Ryan Murphy (BC) Frank Doyle (Maine) Gregg Naumentko (Alaska-Anchorage) and the previously posted ex-Terriers Bryan Miller, Dan Lacouture and Scott Lachance. The newest addition to our sidebar links is "Pointstreak Stats," a powerful service that provides gamesheets, standings and individual stats for a host of junior and other leagues including the USHL, NAHL (with many U18 and U17s games), EJHL and Ontario's OPJHL, the league in which Corey Trivino plays. The NTDP U18 team which features three future Terriers—forward Colin Wilson and d-men Colby Cohen and Kevin Shattenkirk—began its season with a pair of wins in the 2006 North American Hockey League Showcase. And all three recruits hit the score sheets. In a 3-2 win over the St. Louis Bandits, Wilson and Cohen assisted on the game-winner, a powerplay goal late in the third, while Shattenkirk had a helper on the U18s’ first goal. The next night, the U18s stomped the Texas Tornado, 10-1. Wilson led the way with an unassisted goal and two assists. Cohen and Shattenkirk each tallied two assists. In the blog's first guest post, defkit discusses the Terrier goaltending situation and the dilemma of finding opportunities for backups to gain experience when league wins remain so critical. It will be interesting to see how Parker approaches the goaltending this year. John Curry comes in as the clear #1, fresh off a First-Team All-HE, Second-Team All-American season. Karson “Dizzy” Gillespie only saw 4 games last year – two strong performances (including a shutout of defending champ Denver) and two weak showings (the latter of which he was pulled in, effectively ending his season). Finally, Brett Bennett comes in with a strong reputation, but he only played a third of a season in Ann Arbor after recovering from a shoulder injury. Other than the first three games of the 04-05 season, Parker has had no rotation to speak of since Sean Fields was a sophomore. Will Bennett be good enough to force some early playing time? Unfortunately for him, the first real game is on the road, followed by eight straight league games. Not exactly a recipe for some early PT for either BB or KG. We’ve been adding new links to the list of blogs in the sidebar off to the right. One of the best—and most prolific—college hockey blogs out there is The Western College Hockey Blog. In recent weeks, this blog has been previewing the teams in the WCHA and CCHA, providing a quick means of becoming familiar with the top teams and players in those conferences. The blogger also ranks forwards, defensemen and goalies for those interested in fantasy leagues. Today the Western blog takes a brief look at the BU fan-obscenity issue that has been raging on message boards and was covered in the Boston Globe and elsewhere. It links to a guest post by well-know college hockey authority Mike Machnik which appears in the newest blog on our list, The College Hockey News Blog. Elliott Olshansky also offers an opinion on the Rink Rat blog. Time (that is, the lack of it) has prevented this blog from addressing the obscenity issue thus far, but we invite members of the BU hockey community to express their opinions either through comments to this post or a guest post of your own. If you’d like to submit a guest post or this or any BU hockey topic, please e-mail thfblog@gmail.com . The College Hockey News Blog has a very extensive list of links to other blogs in its sidebar. We’ll check s them out and add some to our own list. Again, your suggestions are encouraged. Finally, thank you to the other blogs that have acknowledged this fledgling effort to provide information to the BU hockey community. Sources have told the THFBlog that Ryan Bourque, younger brother of Chris, was a recent visitor to the BU campus. Ryan is a sophomore at Cushing Academy this season, where he'll be a teammate of 2008 BU recruit David Warsofsky and 2008 recruiting target Matt White. Strengths: excellent vision and precise passing; extremely competitive; a very quick stick. Plays a smart, thinking man’s game, without the chippiness his brother displayed. He’ll be an excellent college hockey player. A potential first-line forward. Will he become a future Terrier ? It remains to be seen. David VanderGulik scored a goal in the first Calgary Flames intra-squad game and earned some praise from Coach Jim Playfair: "One of the things we've been talking about all week is after the shot is taken, hunt down loose pucks and go to the net with pucks and he (Van der Gulik) certainly did that and was rewarded for it," commented Playfair. Islanders owner Charles Wang must love his goalies, but not equally. Earlier this summer he named backup goalie (and ex-Black Bear) Garth Snow as the team’s general manager, replacing Neil Smith after just a month. He showed even more love to ex-Terrier netminder Rick DiPietro, locking him up for 15 years for $67.5 million. Looking at the longterm security Rick receives and the relatively reasonable per season salary the Islanders are paying for a top NHL goalie, this appears to be a good deal for all parties. Comments? Captain’s practices began Monday for the Terriers--another marker of the fast-approaching season. As always, there are questions to be answered about the team. -Who will be the surprise player who emerges this season? -Did Chris Higgins add some strength and weight over the summer? -Which freshman are ready for prime time duty? -And, of course, is this club talented enough to repeat as HE champs and then take the next step in the NCAA’s and reach the FF in St. Louis? Jack Parker spent his Sunday evening in Stouffville watching 2008 recruit Corey Trivino (See Sept. 2 post) in the Spirits season opener. The ’90 left-shot center scored a goal in his club’s 5-3 win. As the nation marked the 5th anniversary of the 9-11 attacks, the Los Angeles Times remembered two members of the hockey community lost that day, ex-Terrier Mark Bavis and ex-Bruin Ace Bailey. We previously reported that John Laliberte had become a free agent. He has now signed an amateur tryout contract with the Avs. Thank to Koga for the heads-up....Chris Dyment won't be the only ex-Terrier in Carolina's training camp. Brad Zancanaro, who played a few games for the Lowell Loch Monsters at the conclusion of last season, signed on with the 'Canes in August....Jay Pandolfo and Bryan Miller will see some familiar faces when Devils' camp opens in West Orange, N.J. Ex-Bruin, Ranger and Oiler Dan Lacouture will be on hand and is expected to sign a two-way contract. Congratulations to Dan on becoming a new father. Defenseman Scott Lachance, a member of the '91 Terriers that reached the national championship game, also will be in camp. Lachance, who played in Switzeland last season after many years with Vancouver and Columbus, will be in camp on a tryout basis....After four seasons as an assistant coach with the U.S. National Team Development Program, John Lilley has become the Toronto Maple Leafs' scout for New England. …there is good news from the BU athletic office. An agreement has been signed with CSTV to provide Game Tracker service this season. Game Tracker icons appear on the USCHO Schedule/Results page and, one would expect, on the BU athletics site. Details are not yet available and last year’s link to the services in presently inactive. We’ll update this information when details become available. This is especially good new for some of BU’s most distantly-located, but ardent fans: Dr. Alastair Strain, a Scottish professor who teaches at the University of Birmingham in England and will be at HAA for the 2nd home game this fall; Arthur Berman out in British Columbia who became a Vancouver Giants/WHL fan; and Joe (sorry I forgot his last name) the former BU bandleader, now based in New Zealand and who occasionally posts on the BU Yahoo board. It's the home stretch of the off-season. One month to the New Brunswick exhibition game. Here is a link to where NHL free agents, including several ex-Terriers, have or haven’t signed for the upcoming season. 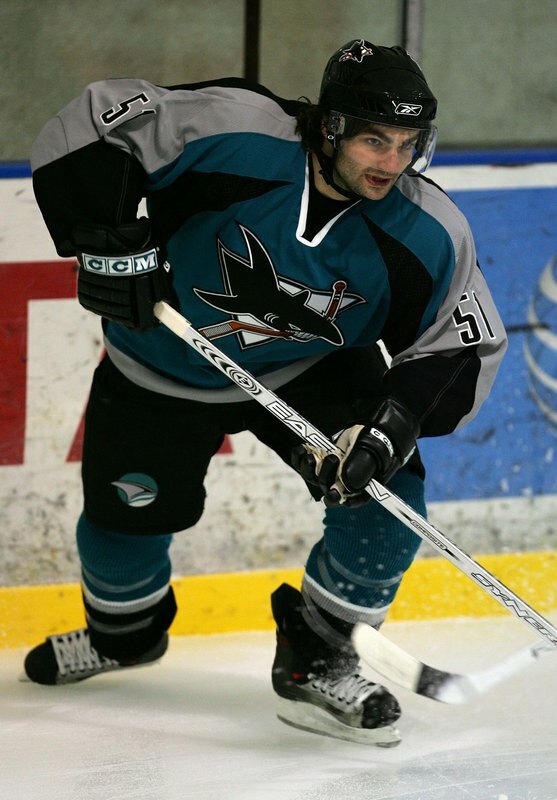 Joe DiPenta is back in Anaheim, but Tom Poti has relocated to Long Island and Mike Grier now knows the way to San Jose. Chris Kelleher isn’t ready to hand ‘em up, so after two seasons in Scranton-Wilkes Barrer (AHL), he’s off to Sweden to play for Linkoping. Shawn McEachern reportedly has retired while neither Scott Young nor Dan Lacouture has been signed for next season. Among the four recruits who have verballed to BU so far this summer, Corey Trivino is unique because he is the only Canadian in the group. Moreover, he is the first forward from Ontario recruited to BU since Chris Heron back in 1996. A native of Etobicoke, Trivino is a product of the Toronto Marlies organization and will spend the next two seasons with the Stouffville Spirit of the OPJHL to protect his NCAA eligiblity. A feature article in New England Hockey Journal takes a look at Trivino and his decision to play for Stouffville. Prior to the 2006 OHL draft, one scouting report said "Trivino is a player that has a ton of offensive tools. He possesses great feet, displaying quickness and the ability to hit another gear when it is required. Couple this with his high level of puck handling skills, and you have a player that can carry the puck and beat opponents one-on-one while playing at high speed. He is excellent on the rush." Ontariodraft.com called attention to his "Incredible hands, especially around the net." A 6'0" 160 lb., left-shot center, Trivino scored 17 goals and 22 assists with just 4 penalty minutes in 30 games with the Toronto Marlboros Minor Midgets. He also has played for Travis Howe's East Coast Selects in the Prospects Tournament and others. Two other future Terriers, Colby Cohen and Kevin Shattenkirk, are East Coast Selects alums. Trivino plays his first regular season Junior A game on Sept. 10. The Stouffville site reports that "Rookie phenom Corey Trivino had two goals and an assist" in the team's final exhibition game.